It’s always exciting to welcome a new member to the family – and that’s exactly what’s happening in The Go-Giver family! 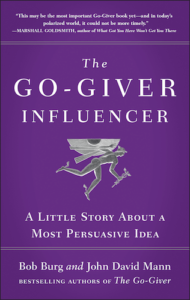 The newest family member – The Go-Giver Influencer: A Little Story About a Most Persuasive Idea – will make its debut on April 10th, 2018. This book, the fourth in the Go-Giver series, is perhaps the most important book of them all – at the very least, it’s one of the timeliest. That’s a bold statement given the enormous success this franchise has enjoyed. The Go-Giver: A Little Story About a Powerful Business Idea was published on December 27, 2007. A parable, The Go-Giver tells the story of a young, struggling, hard-charging, go-getter named Joe. Professionally, he was doing a lot of going – but not a lot of getting. Introduced to a wise mentor named Pindar, Joe learns the Five Laws of Stratospheric Success. He comes to understand the philosophy which is at the very heart of the story: Shifting one’s focus from getting to giving, in this case meaning constantly and consistently adding value to people’s lives, is not only a nice way to live life, but a very financially profitable way, as well. That book has sold over 700,000 copies, has been translated into over twenty languages, and continues to top virtually every list of “best business books” year after year. One of its major accolades is having been named a Friday’s Fearless Brand on October 4, 2013 😊. Go-Givers Sell More – which made its debut on February 15, 2010 – is a compilation of real-world case studies which validate the Go-Giver philosophy. The third family member arrived just two years ago. The Go-Giver Leader: A Little Story About What Matters Most in Business, another parable, delivers the Five Keys to Legendary Leadership. The principal character in this book, Ben, comes to understand that the path to being an effective leader lies less in taking leadership than in giving it. The co-author team of John David Mann and Bob Burg collaborate brilliantly to develop and refine the Go-Giver philosophy. They bring the principles to life in stories which are engaging and effective. Bob and John are fearless brands as individuals – as a team, they have created books which are powerful and timeless – and an impactful book franchise that continues to grow as a fearless brand. Bob Burg and John David Mann are the very soul of the Go-Giver brand. Driven by their love of business and a genuine love of people, John and Bob are a uniquely special team. Over the past decade, they have grown as individuals, authors, and importantly, as a team. Their insights into effective influence seem to be the natural progression for the franchise. As mentioned, The Go-Giver Influencer, may be the timeliest of all books in the series. Our society seems to have more disagreements and people at odds with others than ever before. Sadly, this is evident in politics, on every social media platform, on the highways, and in business. What better time to present a message about the power of understanding and compromise? That’s exactly what The Go-Giver Influencer delivers. In their proven parable style, Burg and Mann tell the story of about two young, ambitious businesspeople, who each have something the other needs and wants. At first, the negotiations are adversarial and frustrating. Then, coincidentally, Gillian and Jackson each encounter a mysterious yet kindly mentor. Over the next week, while neither one realizes the other is doing the same, both Gillian and Jackson learn the heart of both mentors’ philosophies: The Five Secrets of Genuine Influence. 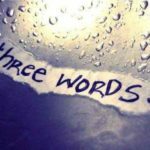 Those familiar with The Go-Giver franchise know that the differences will be resolved – that the story will end in a beneficial, yet surprising manner. Frequent readers know that this is the point at which I typically present my insights, suggestions, and observations regarding Friday’s Fearless Brand. This week will be slightly different. In the case of The Go-Giver Influencer, I’ll leave that task to two people much more qualified to do so – Bob Burg and John David Mann. I urge you to CLICK HERE to visit the book’s website. There you’ll be able to hear directly from John and Bob regarding the book, the story behind its development, and discover special offers for those who pre-order the book. It was my honor and pleasure to read an advance copy of the book. It truly is a timely and worthwhile message – delivered in a powerful story. Some of life’s greatest realities are based on paradox – here are two examples. First, ALL fearless brands experience fear. Secondly, being ‘other focused’ – thinking first of giving – is the surest way to achieve our own goals. If you want to achieve success and live an enjoyable life – build a fearless brand and become a go-giver!